Although pottery dates back thousands of years, true porcelain is thought to have first been made in China during the Han Dynasty, 202 BC – 220 AD. Chinese potters in Zheijiang province are believed to have developed kilns for firing ceramic pots containing small quantities of kaolin clay at temperatures of 1260° C or higher. The first of those fine, translucent ceramics were celadon wares, with crazed glazes that ranged in colour from pale grey green to rich blue greens and intense jade. But from around 800 AD, the chosen color for celadon was the classic soft, pale green that is so recognizable today. During the next 600 years or so, true translucent white porcelains were developed. 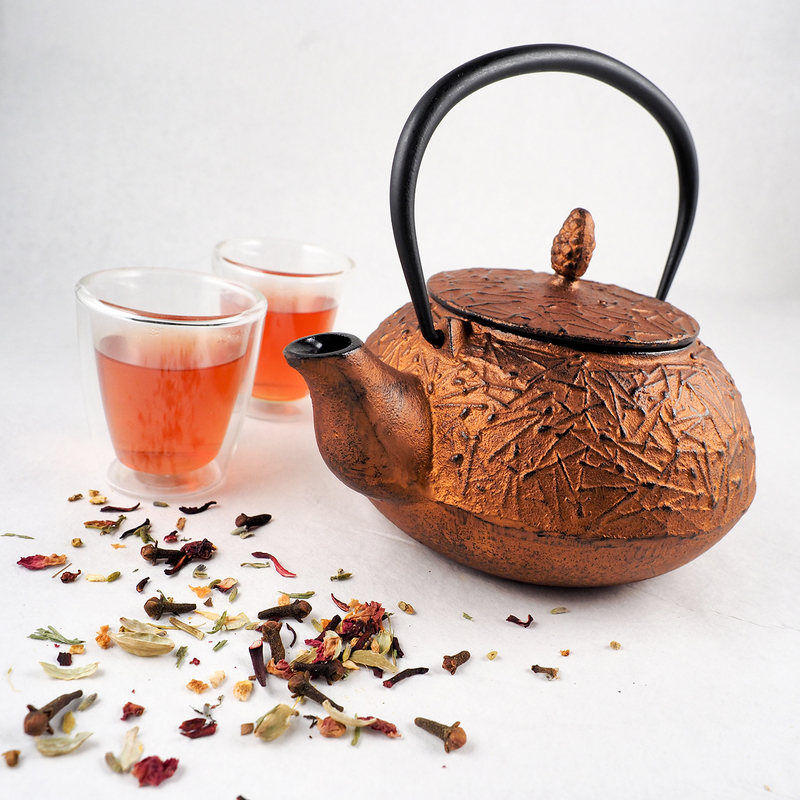 When the Arab trader Suleiman journeyed in China in the 9th century AD, he recorded that, “They have in China a very fine clay of which they make drinking vessels as fine as glass; one can see the liquid contained in them”. 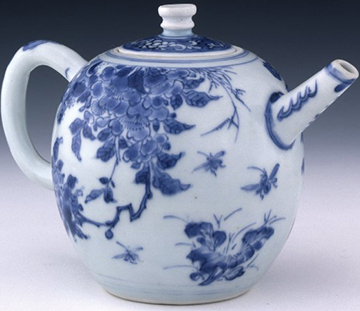 Chinese porcelain teapot c. 1700 manufactured in Jingdezhen. Peabody Essex Museum, Salem. Until European potters realized that kaolin clay was the secret ingredient in the production of high quality, hard-paste porcelain, it was impossible for them to make ceramics of a quality that was in way comparable to the fine China wares. When describing the translucent sheen on Chinese porcelain, the Italian explorer and merchant Marco Polo said that it resembled the shine of ‘porcellana’ (little piglet), a slang word for cowrie shells which look just like little curled up piglets. When the Portuguese started trading with China at the beginning of the 16th century, they carried porcelains back to Europe on board their ships. The Dutch followed their lead and expanded the trade, bringing porcelains and other oriental goods into the docks in Amsterdam and London. 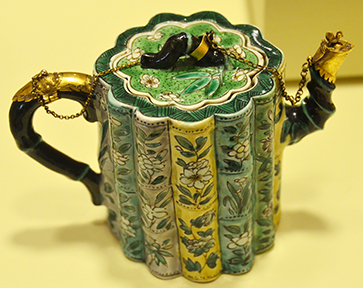 In the first 50 years of the 17th century, more than three million pieces of Chinese porcelain (including thousands of teapots, tea bowls and saucers) were imported into Europe, and customers for these exquisite tablewares included King Henry IV of France and James I of England. European potters were eager to produce similar ceramics for themselves but only managed to manufacture earthenwares covered with an opaque glaze and early ‘soft-paste’ porcelains, made from a mixture of clay, ground glass, soapstone, and lime, and fired at much lower temperatures than the Chinese hard-paste porcelains. Hard paste porcelains are made of a mixture of Kaolin (china clay) and petuntse (china stone) and are fired at temperatures as high as 1350˚ C – 1400˚ C to fuse the materials and make the final product much harder and stronger. The breakthrough for European potters came when two German alchemists, Johann Friedrich Bottger and Walther Von Tschirnhaus, discovered the secret of kaolin for themselves. 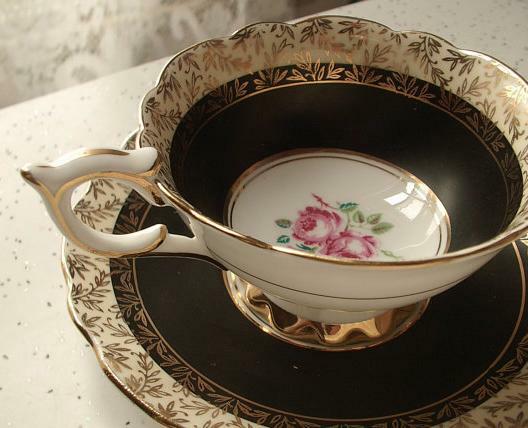 A local source of kaolin clay was then discovered close to the German city of Meissen and the first European hard paste porcelain, containing kaolin cay and alabaster, was manufactured there in 1710. Alabaster was later replaced by feldspar (a common mineral that makes up approximately 60% of the earth’s crust) and quartz. These, and Kaolinite are still important ingredients for hard paste porcelains. The Germans kept the kaolin secret to themselves and potters elsewhere on the continent went on experimenting while the trade with China continued to grow. In 1741, ships belonging to the British, Danish, French, and Swedish brought a total of 1,200,000 pieces of Chinese porcelain into the European ports. A good portion of those pieces ended up in the fine homes of Boston, New York, Philadelphia, and Charleston. 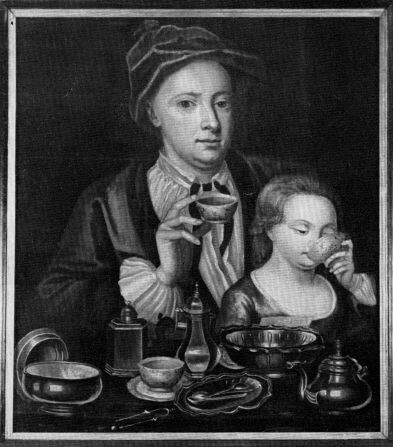 Read more about the history of tea in A Social History of Tea by Jane Pettigrew and Bruce Richardson (2014 Benjamin Press). 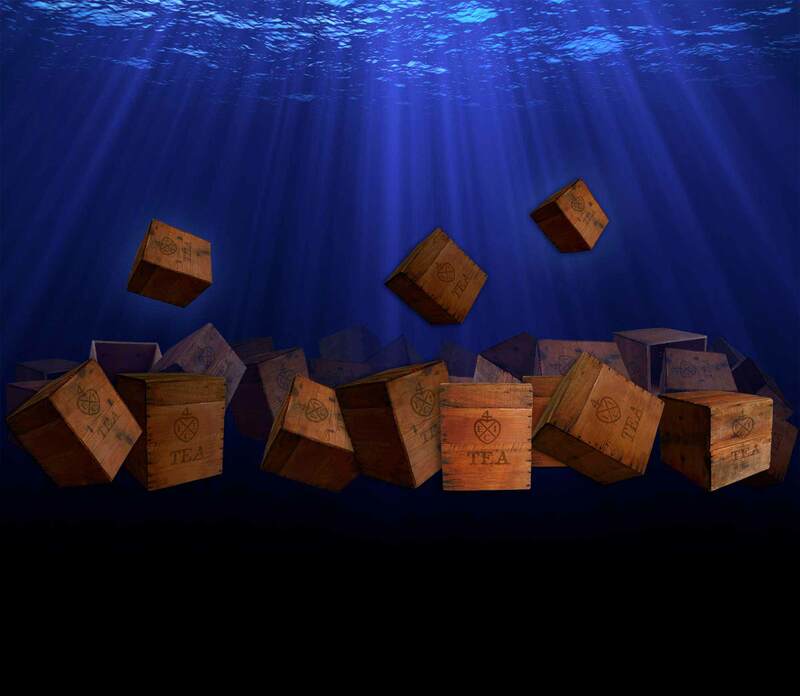 Return to the Tea Master’s Blog directory.